You don't have to have a degree or formal training to enter a booming health-related field. According to the Bureau of Labor Statistics, home health aides and personal home care aides are expected to see 50 percent growth between 2008 and 2018 as the population ages and more individuals need in-home help for basic tasks. If this sounds like a field you'd be interested in pursuing, check out what's involved in a typical home health aide job description. Home health aides work in a variety of settings based on the type of organization they work for. They may travel to the homes of their clients to provide in-home care, or they may work at residential medical facilities. Aides are usually employed directly by home health or hospice agencies that receive at least partial funding from government organizations. In order to continue receiving funding, these agencies must adhere to strict standards, which means that aides are supervised by a medical professional (usually a nurse), and must keep detailed records of client health and progress. 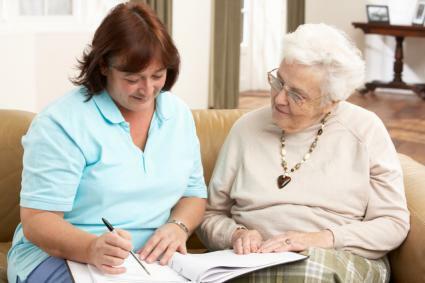 The role of a home health aide is to provide basic care to individuals with mental or physical disabilities or diseases that prevent them from being able to perform the tasks themselves. In most cases, the help provided by aides allows clients to continue living in residential settings, rather than being moved to medical facilities. Just think about what a wonderful service that provides to the clients and their families! Some home health aides are hired directly by an individual or his family. In these situations the aide works independently, receiving instruction directly from the client, rather than from a nurse or supervisor. Depending on the agency, you may work in a residential health facility or in the homes of your clients. In some cases home health aides work in hospice facilities to help with end-of-life care. Hours are often varied - some clients need round-the-clock care, so home health aides may work nights, weekends or early morning shifts. Because of high turnover within home health agencies, you may be able to request a shift that works best with your schedule and needs, although night and weekend shifts often command a higher pay rate. Home health work can be physically demanding and you may find yourself on your feet, bending, lifting and twisting regularly as you help clients perform daily tasks. The most important trait of a home health aide is the sincere desire to help others. The individuals you're serving may be homebound and lonely, so it's important that you have the dedication to show up with a smile on your face and the patience and willingness to serve. If you have these qualities, chances are you're qualified to work as a home health aide. Most agencies don't require a high school diploma and training is generally performed by the agency under the supervision of a nurse or more experienced aide. If your agency receives funding from Medicare or Medicaid, you will have to undergo a 75 hour training program and subsequent competency evaluation. During this training program you'll learn skills like how to safely transfer a client from a bed to a wheelchair, how to take vital signs and very basic nutrition education. Depending on your state and agency requirements, you may have to undergo a physical to ensure you're in good health. Also, agencies may perform a background and safe driving check to ensure that you're ready to work with clients. Most home health aide positions can expect to receive between $9.00 and $11.00 per hour, with higher rates going to individuals working in medical facilities or working odd shifts. These positions may be especially good for individuals who are pursuing education, raising a family or need to take on a second job because the work is part- or full-time and openings are plentiful.